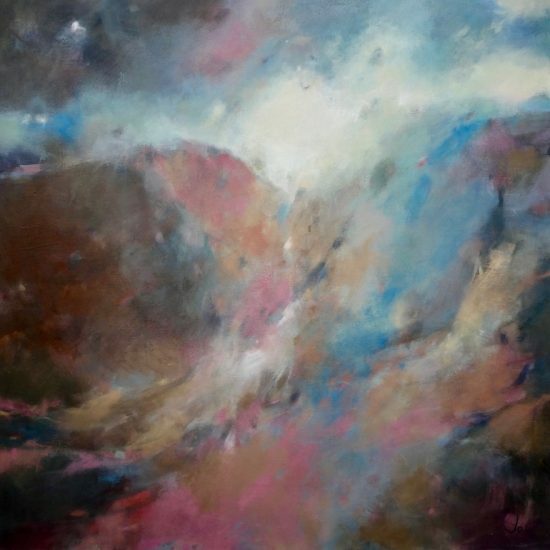 Jo Jenkins retired from a career teaching Art some ten years ago and has painted full time ever since. 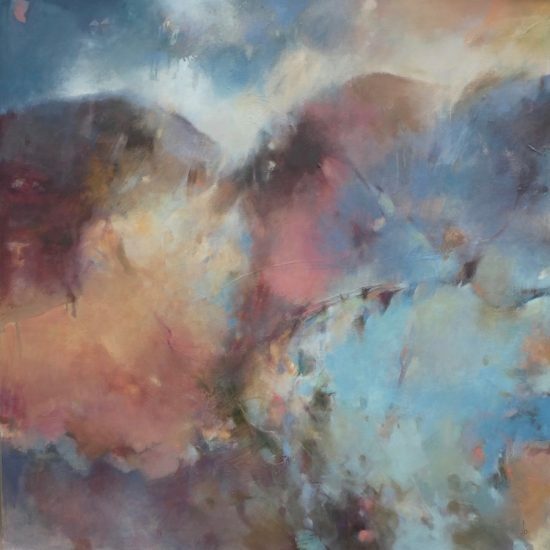 Her paintings are a response to places she has visited and images she remembers, whether it be walking in the Lake District, the Himalayas or New Zealand. She is always affected by the sense of space and openness, but also by man’s imprint on the landscape and his need to organise it. Paths, walls and fences can lead to marks, patterns or shadows. Dramatic qualities caused by weather conditions always excite her. She is fascinated by situations where the shapes and colours she sees can produce ambiguous effects, maybe due to mist, sleet or low cloud. Some pieces contain figurative qualities, whilst others can be increasingly abstract. Jo works in an intuitive way, never knowing what the outcome will be. She paints on a number of pieces simultaneously, on canvas with a gesso ground, responding to qualities as the emerge. This gives drying time for the oil paint she uses. She always enjoys entering her studio and breathing in the smell of work in progress. Her paintings are in galleries and collections in the UK and abroad.